It was pleasure to travel with Sanju! Very polite person with comfortable car with plenty of facilities like WiFi, charge ports and Bluetooth radio for our native music. 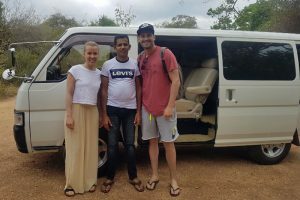 What is more he was the first driver who can ride a car professional and calm not as a 90% drivers around the Sri Lanka. And at the end what is I think most important, price… we were shocked how little we paid for this class of the car. We will use Sanju shuttle service at least one more during our holidays. Hope you best Sanju. We hired Sanju for a 6 hour journey between Ella to Colombo. He was very punctual and reasonably priced. His van was extremely comfy with Wi-Fi, Bluetooth and charging points. I was even able to recline my seat to sleep!! Would highly recommend. We used Sanju several times during our stay in Sri Lanka. 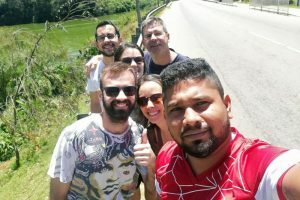 He was brilliant, very helpful and provided us with some great advice as well took us to see some interesting places. His car is vary spacious and always clean. We really recommend him. He was a very good driver and offered us a superb deal! His driving was very good and he tried to make everything as comfortable as possible. His van was very spacious and we enjoyed our ride with WiFi on board. Great guy! 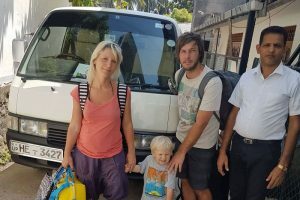 Sanju is the best driver in Sri Lanka. He is very friendly, always on time and the van is clean, comfortable and offers WiFi. Prices are very reasonable and we always felt safe during the trips. We highly recommend ! Sanju's van is very roomy & comfortable. He offers wifi, bluetooth connection to play your choice of music through the speakers as well as charging sockets for your electrical devices. He arrived on time, is very friendly and offers competitive prices. Highly recommend! 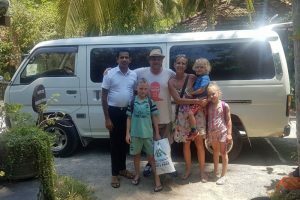 My Name is Sanju .who is well experienced tourist guide in Sri Lanka. I have been working as National guide since 1996. Before I started this Sanju Travels I had worked in under Several travel agencies in Sri Lanka. Now in present now I’m able to organize tours and I can arrange accommodation which are A grade Guest Houses and One Star to Five Star Hotels according to your request. Not only hotels and other needs that you want for your tour can be arranged according to suite your budget. My tour plan always consist with your interest. because this is your holiday so you must spend your holiday as your wish with your interests. It is privilege for me to show my country to you. I show my country safely and comfortably my driving is so carefully and vehicle is always very clean manner and fully insured on behalf of you. Your responsibility is in my hand since arrival from Air port to Air Port Departure.